Spring is in the air… finally. I have been itching to get and about with the camera for several days now, ever since the Japonicas burst into bloom with their beautiful, vibrant orange-pink flowers. I also noted that the almond tree wasn’t too far behind, with buds aplenty. It has been warming up nicely, and apparently the bees won’t come out to actively forage until the temperature hits 13 degrees. And full foraging is not acheived until it warms up beyond 19 degrees. It was pleasantly mild at the beginning of the week, but then we were hit by a Vent d’Autan – a quite violent wind coming at us from the east, and this time gusting up to 60 kms/ hour. It lasted for 48 hours, and at times it felt like the roof of the house was coming off (luckily, it didn’t). I certainly didn’t feel like venturing forth, and I imagine the bees stayed indoors too. Conditions yesterday were much improved, so off I trot with trusty camera to see what’s going down in honey bee world. 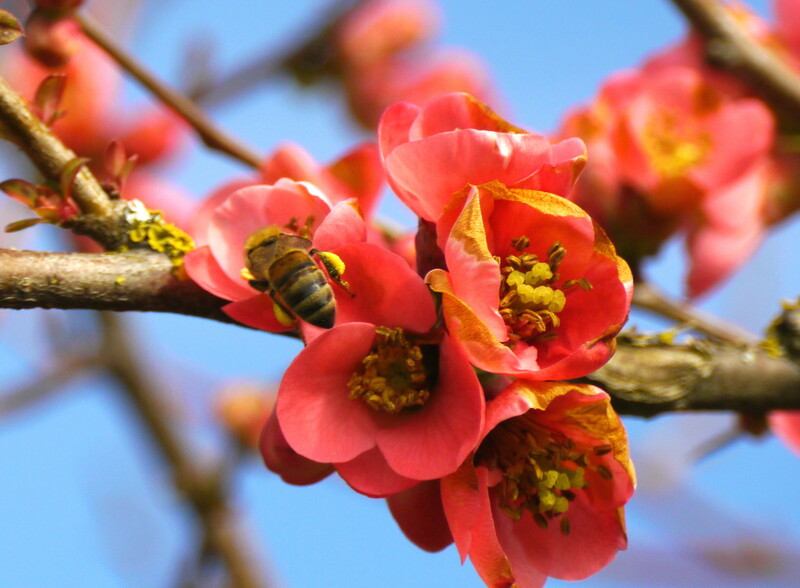 And lo, there were the girls hard at work, collecting pollen from the stunning Japanese Quince (Chaenomeles japonica) bushes. All very photogenic – that’s the calendar image for March 2014 in the bag. Just next to the Japonicas is a splendid almond tree, starting to blossom. I love this flower, with its tinges of pink and incredible perfume. The bees were here too, gathering up the yellow-brown pollen. 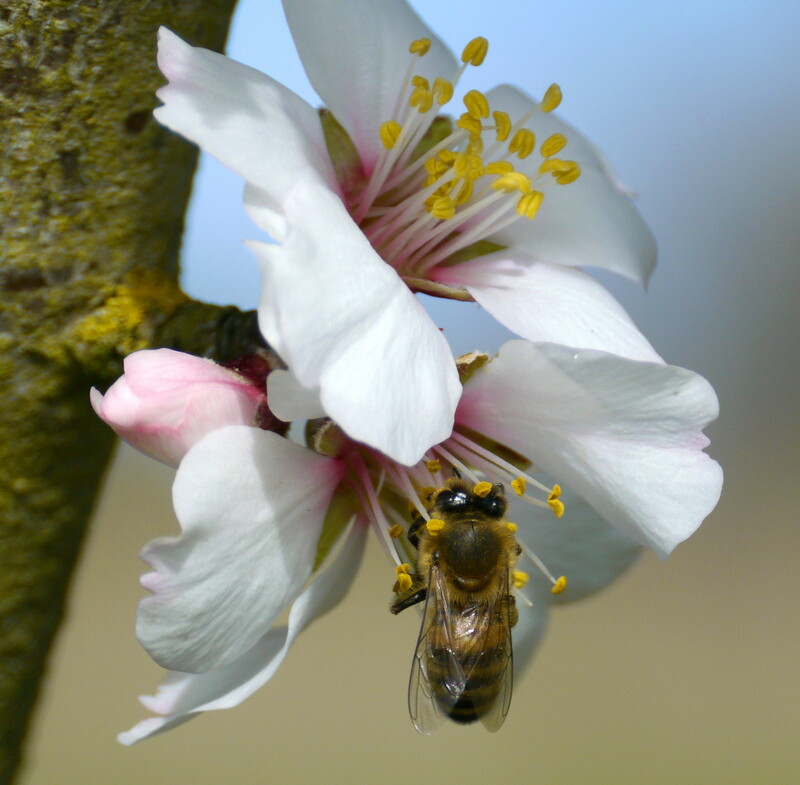 This pollination work is important in the big almond producing regions of the world – the pollination of California’s almonds is the largest annual managed pollination event in the world, with close to one million hives (nearly half of all beehives in the USA) being trucked in February to the almond groves. We have a whopping two trees, so hopefully the girls won’t bee too overwhelmed with the workload.